It is late October, and time is running down. You're looking at schools with all sorts of questions swirling around your head. Which ones to apply to? Which one is your favorite? Will you like it better here or there? Where will you fit in best? One great thing about UVa is that there is so much going on you are guaranteed to find something that interests you; an organization that you will love and want to commit your time to. And if there is something else you want to get involved in, and UVa does not have it, then you can create it! I am currently a part of Black Student Alliance (http://www.student.virginia.edu/~bsa/), the University Judiciary Committe (http://www.student.virginia.edu/~judic/index.php), and a program called "I Have a Dream" that mentors a group of students at a local high school. 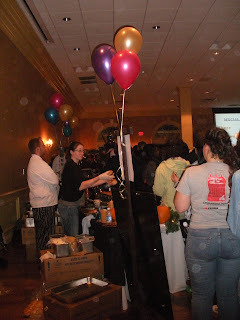 The Black Student Alliance puts on many events such as Townhall Mixers, Ladies Cocktail Soiree, Black Men's Breakfast, Tailgates, and plenty of other social and political events. 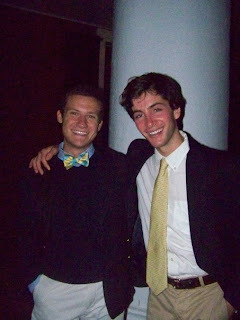 The University Judiciary Committee is UVa's student run judiciary system. "I Have a Dream" is a mentoring program that follows a group of students throughout their academic careers and helps them pay for college. The Charlottesville group is currently in the 10th grade. All three of these groups I am very involved in and absolutely love. I have met some great people through these organizations and I continue to meet great people through them. Getting involved with something you're passionate about is one of the best ways to meet new and interesting people. 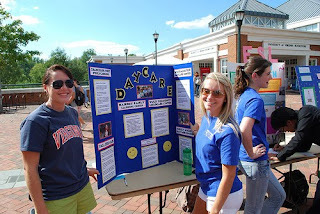 So when you decide to come to UVa :) find something you love and get involved! If you’ve done even a little bit of research on UVa, you are probably well aware of the special lingo we use here around grounds. There we have a unique term already! “Grounds” instead of “campus.” You have also probably heard about how we say “first year” instead of “freshman.” An additional lingo tradition stems out of respect for the founder of our University who did not have a Ph.D. – Mr. Jefferson. Here at The University, faculty are referred to as Mr. or Mrs. instead of Doctor, even if they have a Ph.D. While such a tradition may seem silly, I think it highlights the warm, humble personality of so many of our professors here at UVa. The University is full of brilliant and accomplished professors who are still relatable and available to students. My very first semester at UVa, my Economics professor, Mr. Coppock, invited me to attend church with his family and hosted a dinner at his house for our entire class. This semester I am taking a course with English Professor Michael Levenson and find each lecture so stimulating that the fifty minutes of class literally fly by. Though a leading expert on modern literature and critical theory, as well as the author of many esteemed works, Mr. Levenson is so relatable and engaging that he can somehow connect Joeseph Conrad’s Heart of Darkness with last Monday’s episode of Gossip Girl. A few weeks ago, my Commerce professor, Jack Lindgren, invited our whole class over to his house for food and football. While watching the Patriots battle the Broncos, Professor Lindgren offered to give us golf lessons at Glenmore – the course on which his house sits. As you can see, professors at The University do more than just teach students in class; University professors invite students to share in life together, and in doing so they develop the academical village into an academical family. Their willingness to allow students to refer to them as Mr. or Mrs. symbolizes their approachability and the fact that they care more about their students then they do about their title and own accomplishments. 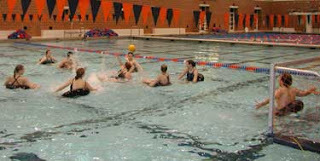 When you come visit our beautiful school, be sure to sit in on a class and experience the UVa faculty for yourself! I've said it before and I'll end up saying it dozens of times over again to prospective students. Don't ask a magazine or ranking poll what college you should go to because you could end up seriously disappointed. Instead, figure out what you want in a college, and if writing out that list is difficult, then visit the colleges or universities you think you may be interested in. Talk to the students. Ask them what their favorite and least favorite things are about the school, why they chose the school that they did, and what do they do in their free time. It's so important to know that you'll have internships, jobs, sporting events, musical performances, and a host of other options available so that no matter what your mood is, you'll have the opportunity to go do what you want to do. Now I must admit I love food. 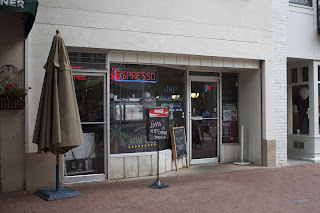 Restaurants, coffee shops, bagel stores, candy factories--they all sound amazing to me, and one of my favorite places to go to eat is Downtown at Chaps. If you go to Chaps, you will probably get to meet Tony. This is Tony. He is awesome. Definitely one of the warmest people I've ever met, Tony is the kind of guy that always greets you with a smile and will remember your name. In general, I love diners because they remind me of Bethel Park, Pa where a majority of restaurants are owned by a family rather than a chain. The atmosphere is cozier, homier. I feel more like I'm walking into a friend's kitchen rather than somewhere less personable like McDonald's. Now, there's nothing wrong with McDonald's, but for me, I will always choose places like Chaps again and again because they are unique. McDonald's? The burger you get in Cleveland is identical to the one in Austin. You will not find another Chaps anywhere, and whenever you travel--be it for work, play, or whatever--go to these types of stores. Seek out those unique stores because that town is your only chance to experience them. 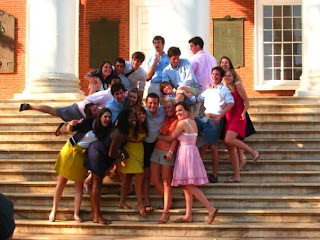 One of the greatest traditions that we uphold at UVa is our devotion to the idea of student self-governance. I’m not sure if this is a new term for you, but if it is, rest assured that it is not a difficult concept to grasp – it means what it says; at our university, the students decide which issues are important and, subsequently, the students lead the initiatives to make things happen. 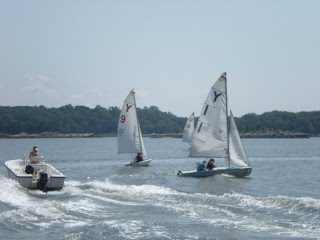 From seemingly trivial issues, such as where to place recycling receptacles around grounds, to more grave situations, like trial proceedings for a peer accused of breaking the honor code, it is individual students who make up the groups that ultimately decide what happens. Opportunities to join groups (which we lovingly refer to as “CIOs”) arise all the time, and, particularly, the Student Activities Fair that occurs at the beginning of each semester is when organizations do the majority of their membership recruitment. Moreover (even though it seems like there is something for everyone here), if you find out that what you’re looking for doesn’t quite exist yet, you are encouraged to start an organization yourself! Not only does it take the student body’s feeling of accountability to a whole new level, but it is a system that embodies everything Mr. Jefferson’s University stands for. Tonight was one of the rare occasions that the entire Student Council (StudCo) met as one (I think that only happens once a year, as Student Council consists of 200 members or so), and, with many of the students leaders at this university under one roof, it was pretty easy to latch onto the excitement and commitment that emanated throughout the room. Split up into various subcommittees such as Student Arts, Athletic Affairs, Environmental Sustainability (this is the committee that I am a member of), Academic Affairs, etc., StudCo encompasses a vast range of topics that directly affect the University, and is the physical embodiment of the term “student self-governance.” Among other things, in the past Student Council has: run campaigns to unify UVa with the surrounding Charlottesville community, worked closely with faculty to discuss plans for the University’s new president, partnered with local cab companies to provide free rides for students travelling alone at late hours, and countless other proposals that affect us all as UVa students. So, aside from the other million-and-one brilliant reasons as to why you should consider the University of Virginia among your top choices of colleges, you can add our strong and proud tradition of student self-governance to your list! As always, feel free to email me any questions! This semester, I'm taking my first UVa English class; Modern Irish Literature. It took my inner history major a bit of time to adjust to reading novels instead of manuscripts, but I've been really enthralled by all of the books, short stories and poems that we've read so far. 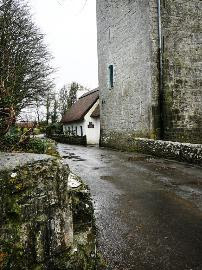 So much so, that I've just signed on for a two week January term program with the professor of the course...in Ireland! I always knew that I wanted to study abroad, but there was no way that I could leave UVa for a whole semester. So when I found out that I could take three credits in Ireland over winter break, I was sold. The course studies Irish literature, music and art, and our time will be split between Galway and Dublin. 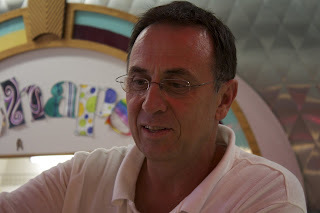 We'll spend part of each day in a classroom, and will then have the afternoons for cultural exploration. In taking walking tours, attending theatrical performances and engaging in conversation with local people, we'll get a fantastic sense of the true Irish culture that you can't learn about in a book. This will be my first trip to Ireland and I cannot wait! I'm already counting down the days to my arrival in Galway (78 left!) and can't wait to post pictures and stories when I get back! As always, shoot me an email with any questions! Prospective students, believe it or not, this will be you someday at whatever college you choose to attend (hopefully UVa!!). As obvious as that sounds, somewhere between the teacher recs and essays, I think it’s easy to loose sight of the fact that you really will become a college student someday and all of your labors will be well worth it. In the craziness of applying to college, there is hope alas. Right now, I imagine, many of you seniors are indeed somewhere between the teacher recs and essays. I hope that it is going well! It’s hard to believe that was only a year ago for me. I wrote my Common App essay on the issue of corruption in the business world because of an internship that I’d had the previous summer. If you’re planning to choose that topic, I suggest relating it to a personal event as well. As for the UVa supplement (for the College of Liberal Arts & Sciences), I wrote about a painting of my grandmother’s for my “favorite work of art, literature, or math” and then I discussed the quote for my second essay, relating it to some events in my high school career. Having just gone through the essay-writing process less than a year ago, my best advice is to make it personal. You could easily answer the Common App and UVa Supplement essay questions without providing much personal depth, but don’t fall into that trap. Also, I know that it’s easy to really stress about the essays, I certainly did. I would encourage you to resist that temptation and take heart in recognizing that most of work is already done. While my essays were important, they certainly did not get me into UVa. Now that I’m on the other side, I realize that four years of working hard both in school and in extracurriculars did. The fun will come in late March/early April when admissions decisions come out and you’ll be one step closer to being on the other side, hopefully at UVa with me! 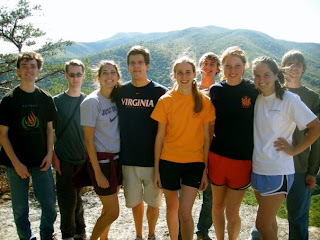 Also---because blogs are just not as fun without pictures, here's a picture of me and some RUF friends on a hike last weekend! Best of luck with everything guys! Shoot me an email if you have any questions! In my college career, I've listened to two of those: the sexfest and the nutrition programs. Sexfest was basically a sexual education talk and the nutrition is pretty self explanatory. I found them very helpful because the student presenter(s) explain the topic and you can ask questions about anything related. The atmosphere created is very comfortable and no one is forced to be in the program. I wanted to share with you all something I learned in the Nutrition program this past Thursday: know your portions. 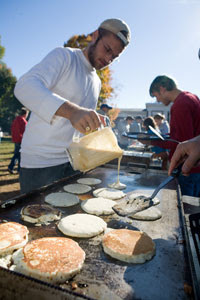 Pancake flipping, apple picking, candy “tricking” and treating… There’s more to fall than the chilly air and the changing leaves - at least at UVa. The Charlottesville fall is delicious. Pancakes for Parkinson's was founded in 2004 by Mary McNaught. This Saturday, thousands of UVa students and Charlottesville residents will come together on the lawn to enjoy the event. Music will be played, pancakes will be flipped (and eaten), and the voluntary contributions of many will make an indelible mark on the fight against Parkinson's disease. 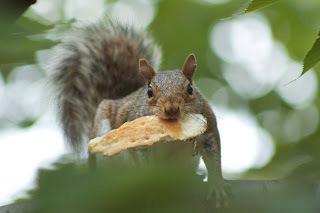 It's one of UVa's dearest autumn traditions. 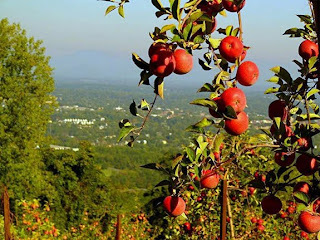 Last fall, I got a taste of another delicious UVa tradition: apple picking. Every October, students explore the orchards of Carter Mountain in search of the perfect apple or pumpkin. To be honest, it's more like a hill than a mountain; you won't need your hiking boots! You will need an appetite, however. After purchasing your Pink Lady and Granny Smith, you can indulge in warm cider and apple pie. It doesn't get much better than that. We're 26 days away from my favorite fall event: trick-or-treating on the Lawn. 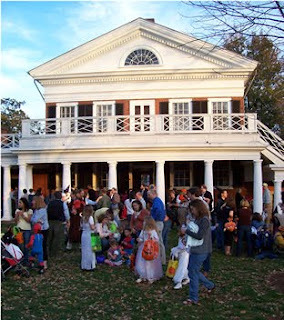 Charlottesville toddlers sweep the lawn as ghosts and goblins and UVa students distribute candy from the pavilions and student lawn rooms. It's no haunted hayride, but it's an event that can't be missed. Charlottesville embraces the University in so many ways so it's wonderful to see the University embracing the children of Charlottesville. 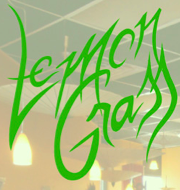 Come out on Halloween for a wicked good time! Take some time to digest all of the deliciousness I've just described. I don't know about you, but I'm salivating. Like a pancake, an apple, or a bar of chocolate, Charlottesville has all of the right ingredients to make it a rich college town. If you've yet to travel to UVa, it's about time you have a taste. We're 77 days from winter...and you won't find any apples in the snow! So I know most of you are at that point where you're looking at a ton of schools, trying to figure out what college is the best fit for you. You have no idea what to write you're essays on, or even how to find the applications on some of the web sites (I remember it took me a while on some sites..). Well, have no fear because I'm here to give you a little insight on the whole process! I looked at a million schools. In the spring of my junior year every long weekend or school vacation I had my mother would be dragging me off to look at colleges. At the time I was annoyed by it, but looking back it was probably the best decision. Visiting all of the different colleges I was interested in really helped me to get a feel for them. I was able to talk to students and find out why they came there, and walk around the campus and just see what people were interested in and how they spent their time. I did two things at every school that really helped me figure out what it was all about, and if you're stuck on a school I recommend it. When I met a student, I would always ask them one question: What is your favorite thing about (college name) and what is your least favorite thing about (college name)? Sometimes people told me awesome things about their college that I would never have known otherwise, and sometimes people told me something they didn't like about their school that made me realize that maybe it wasn't the place for me. 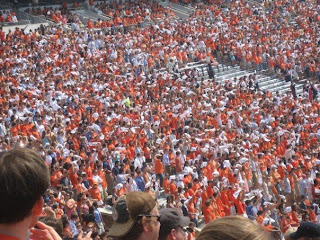 For the record, I couldn't find anyone at UVa that could tell me something they didn't like about the school. The other thing I always did was I looked at the bulletin boards and flyers to see what sorts of things the school did and what kinds of groups they had. 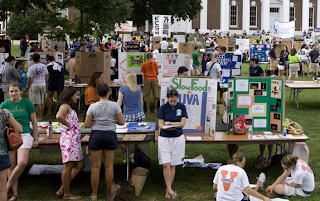 The thing that interested me in UVa was the fact that there were so many different groups and activities going on throughout the campus. 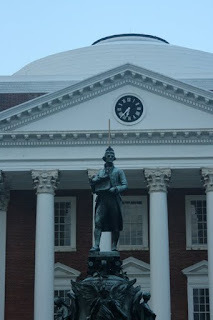 UVa wasn't really on my radar when I first started looking at schools. I was looking more for a city school with tons of activity, but someplace that also had access to the outdoors where I could hike. I was hesitant about visiting UVa since coming from Boston it was the "South" but when I saw it I couldn't resist the beauty of Grounds. I wandered around and started talking to students, and every single person I talked to was so excited that I was looking at UVa. 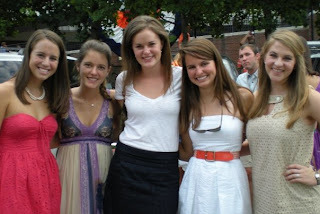 I had never had that sort of reception before, and it made me realize that everyone at UVa actually was so excited about their school that they wanted other people to be as excited too. Now, two years later, if a high school junior/senior came up to me and asked me about UVa I'm pretty sure I would be super excited too. The more I learned the more I liked, and I soon figured out that it was pretty close to what I was looking for. 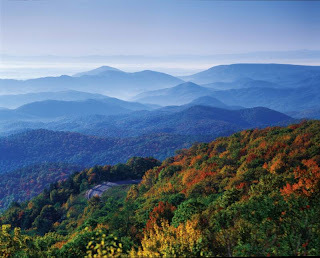 Charlottesville is a beautiful city with so many resources available to get involved in the community, and the Blue Ridge Mountains are only a short drive away. Everyone loves the school, and people who go here work hard but know when it's time to just kick back and relax. 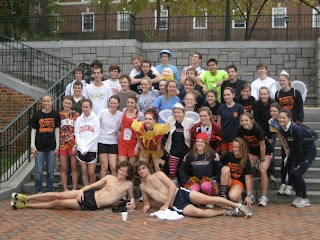 When the time came I applied to 12 schools, UVa included. I know it may seem like a lot, but I was genuinely interested in each school, and they were each a little different. I had big schools, small schools, rural schools, city schools, schools close to home and schools far far away. I did have to write a lot of essays, but to be honest they seem worse than they actually are. My best piece of advice is to just write about something you love. If you write about something you love, your personality will come across on the paper, and after all thats what colleges are looking for. I wrote my essays on running, rock climbing, and traveling. Not complicated subjects, but each things that I loved and could really show my personality through. 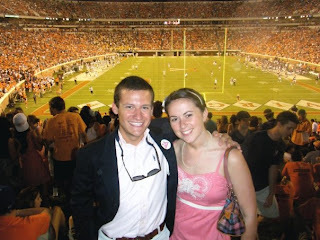 In the end, I was accepted to UVa and after much deliberation chose to come here. It wasn't an easy decision, but its one I'm really glad I made. I've loved every second of it! If you have any questions about the application process, both at UVa and elsewhere, don't hesitate to shoot me an email!